William's birth date of 21st July 1755 is recorded in the records of The College of Arms. He was baptised on 4th August 1755 at St Peter the Great, Worcester with his twin brother, George. In letters from William’s mother and sister to George, William’s twin brother, between 1769 and 1773, he is referred to as Billy and from time to time labelled a troublesome boy! In a letter from Billy’s mother to George of 10th July 1769, Elizabeth inserted a P. S. “I have not heard from Billy this month. I think to write soon to his Uncle (Thomas Gaskell) about binding him”. He was bound in 1770 to Henry Hammond of Worcester for £40 as a “walker cloth”. William’s Aunt, Ann Misenor, states in her will of 1784 that William was then a Linen Draper in Oxford Street, Middlesex. Lowndes Directory of 1782-1784 confirms William’s address as 81 Oxford Street and the shop that of a Linen Draper of which William was the owner; the shop was called “Gaskells”. This Aunt left half her considerable estate, after small bequests to many relatives, to William and the other half to his twin brother, George. William presumably sold the Line Draper’s business in 1784 when he came into this inheritance. On 5th September 1794 William was commissioned into the Herts Militia with the rank of Lieutenant. The Herts Militia was rather like the Home Guard of World War II and on 24th October 1797 William was promoted to Captain. In December 1799, as Captain of the Herts Militia, William was earning £14.2.6 a month on top of his considerable inheritance. His Lieutenant was Charles Sabine, a personal friend who later appears as Executor of William's will; other military staff under William were: 5 serjeants, 2 corporals, 2 drummers, and 60 "private men". Charles Sabine earned £8.10.0 per month. At the age of 40 on 28th December 1795, William personally appeared at the Faculty Office of the Archbishop of Canterbury to swear a Marriage Allegation. William was of Colney, Hertfordshire; he married Elizabeth Kynaston on 31st December 1795 at Witham Parish Church, Essex. Witnesses at the marriage were all brothers and sisters of Elizabeth. At the time of the marriage William was living in the Parish of Colney, Herts and Elizabeth in Witham, Essex. The parish of Colney, from where William came at the time of his marriage in 1795, lay within the Parish Church of Saint Peter, St Albans. The rate book ran until 1793 with a break until 1803. A 1793 entry (15th May), for repairs to the church, lists a Mr Gaskell as a resident. In 1797, William and Elizabeth were living in Shenley, Hertfordshire, where their eldest son, William Kynaston was baptised. 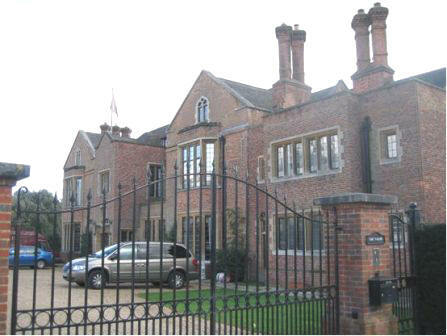 William and Elizabeth were probably living in Aldenham at the time of the births of their daughters, Elizabeth Ann and Ann. In 1803 William and Elizabeth moved from Shenley to The Vache, Chalfont St Giles, Buckinghamshire and William resigned form the Herts Militia; their residence at the Vache is recorded in the baptismal record of their daughter Mary. See further reference below to The Vache. The Rate Books for Chalfont St Peter has entries prior to 1803 and post 1813 - between was missing. The first entry in the book is on 5th May 1813. "Captn Gaskill (error) for Vauch Meadow"31st December 1817 "Captain Gaskill 12/6. For tithe 2/6". It would, therefore seem probable that William and Elizabeth came to Chalfont St Peter between 1803 and 1805 - almost certainly, they arrived at the latest in 1805 since Charles Thomas Gaskell was born in that year and baptised in Chalfont St Giles. William Gaskell is mentioned in the Rates book 1821 and 22(as ex), thereafter until 1833, “Mrs Gaskill or Occupier”. In the Gentleman's Magazine of 1818, there is found a Compendium of County History addend &c to Buckinghamshire of Vol 86. Present State and Appearance. Eminencies and views listed. Seats listed and including. The Vache, - Gaskell, esq. Note: The Vache is a very large house in Chalfont St Giles, which was, until c.1980, the Training College of British Coal. His death on 25th May 1822 in Chalfont St Peter, Bucks, is referred to on a memorial. plaque on the south wall inside St Peter's Church. A resident of the Parish advised ROHG that before the vault was "recently" (c.1968) concreted over, due to damp problems, he entered the vault and discovered two large coffins and a tiny one laid on top of one of them. Therefore, one coffin is missing or possibly Ann was not buried there! William was buried on 31st May 1822 and his address was given as Near the Turnpike. His will was dated 15th July 1820. The executors were Thomas Gaskell, his nephew, of St George's, Hanover Square; Chas. Sabine of Carmarthen St, St Pancras; William Kynaston Gaskell of Chalfont St Peter (son). Bequests: He leaves to his wife Elizabeth "the house we live in" with contents & carriage & horses; and £1200 p.a. (£54000 in money of 2002) from rents and ground rents from 41 Newman St; 9,13,15 & 46 Francis St; 48 Gt Marylebone St; 19 Thornough St; 34 John St, Paddington St and properties in Court Road, Tottenham Court Rd and Richardson Terrace. This income was for her life and after her death to be equally divided among her four younger children. To son, William Kynaston Gaskell, £3000 p.a. (£135100 in money of 2002) from rents and ground rents from various properties in Carmarthen St, Thornough St, Chenies Mews, Marylebone St, London St, Oxford St, John St, George St, Lambert's Hill. To son, Charles Thomas Gaskell, £1000 p.a. (£45000 in money of 2002) from rents in Seven Dials, Store St, James St, Cleveland St, Upper Marylebone St, George St, Kinton St, Portman St. To daughters Ann, Elizabeth and Mary £500 each p.a. (£22500 in money of 2002) from properties in the same area of London. Interlinings were sworn in the Prerogative court of Canterbury on 15th June 1822 by, personally, Thomas Gaskell (then of 18 Howland Street, Fitzroy Square, London) and a William Lewis, who claimed to have known William for a number of years and was familiar with his hand writing and signature. This William Lewis was of Carmarthen Street, Tottenham Court Road, Middlesex. In the Will of William’s twin brother George in 1796, a William Lewis, Dyer and friend/colleague of Burnhill Row, St Luke’s Parish Middlesex was left £5. Could they be one and the same? Probate was granted on 18th June 1822 by the oaths of Thomas Gaskell, the nephew and William Kynaston Gaskell, the son. The Gaskell Grant of Arms was granted posthumously to William Gaskell and his descendants. William was clearly progressing the grant of arms before he died. His son, William Kynaston Gaskell assumed the petition and was granted the arms. On 8th August 1822, according to the Faculty Book for the Diocese of Lincoln 1785-1831 it is recorded that approval was given to William Kynaston Gaskell (son) for a vault in Chalfont St Peter's Church. The letters from William’s mother are held in The Worcester Record Office, St Helen’s. William’s marriage to Elizabeth is referred to in the marriage records of the church, College of Arms records and also mentioned in the Gentleman's Magazine; this entry refers to "William Gaskell efq of the Herts Militia". The Chalfont St Peter Rate Books and Faculty Book for the Diocese of Lincoln were viewed in Buckingham County Record Office in Aylesbury. William’s will is at The Family Records Centre in London. Apprenticeship details come from the Record of Apprentices held at The Society of Genealogists - reference 57/174. "The General Armoury of England, Scotland, Ireland and Wales" by Sir Bernard Burke C.B., L.L.D. Ulster King of Arms, described the Gaskell Coat of Arms, but made no mention of pedigree.